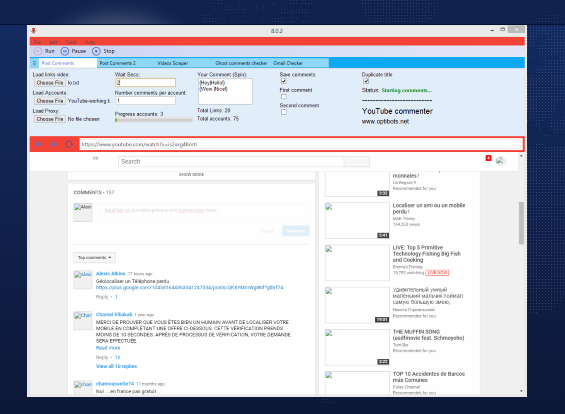 With this software create for youtube you can put comments with features inteligent to allow you to bypass the security youtube, comment youtube, rate commenter, subscribe, like or dislike videos. Our software is sold under license it runs on a single computer but we can give you access to the other computer. Software is 100% configurable and our team continues to add functions to make the software even more robust. Bypassing the google check with to the recovery email in order to use proxies on the software and continue the job. Access to all our tutorial videos, forums to much understand well the bot operation and for a better setup. Our software is designed to generate full of clicks on your site, video, worldwide content. Here you can see the last update of the bots automation software, contact me for any information/help or support. Copyright ©2012-2018 Software automation. Designed by	Templatesquare.